How does The Pokémon Company celebrate the 20th anniversary of its extremely lucrative, multimedia franchise, a powerful brand that encompasses video games, trading cards, movies, television shows, toys, and more? 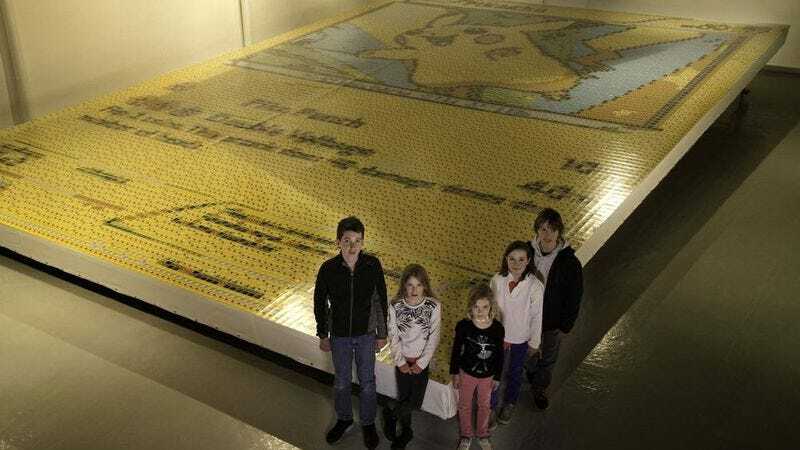 There’s really only one thing to do under such circumstances: Create the ultimate Pokémon card, a massive mosaic constructed from nearly 13,000 normal-sized cards, all of which join together to form a portrait of Pikachu, the chubby yellow rodent who serves as the ambassador and mascot of the Pokémon brand. The Brobdingnagian card, currently on display in Paris, is the creation of U.K. artist Quentin Devine, apparently as some sort of strange attempt to claim a world’s record in an extremely obscure category.